Income Volatility has become “the new normal” for many families—particularly for low- and moderate-income families. Traditionally, grantmakers have focused on workforce development and upskilling as part of economic mobility strategies for low-wage workers. However, as work has evolved and jobs look more different than ever, it is critical to understand the impact of these changes on income—predictability, variability, and frequency—and how this affects the opportunity for mobility. This problem is not the same as income insufficiency, or simply the story of stagnating wages over the last few decades. These same workers are experiencing low-wages coupled with major week-to-week and month-to-month fluctuations in their income. When this volatility is combined with a general lack of upward mobility, the results are toxic: high-interest debt, unstable housing, and food insecurity, among other destabilizing effects. Income volatility combined with wage stagnation helps explain the precarious position many families find themselves in today. And while volatility makes it harder to manage cash flows and can trigger demand for high-cost financial credit products, it also seems to have serious downstream effects on the health and education outcomes of children. Essentially, income volatility undermines every investment in education, public health, and economic development, chipping away at what would otherwise be positive returns. ASSET FUNDERS NETWORK (AFN) The Asset Funders Network (AFN) is a membership organization of national, regional, and community-based foundations and grantmakers strategic about using philanthropy to promote economic opportunity and financial security for low- and moderate-income Americans. AFN works to increase the capacity of its members to effectively promote economic security by supporting efforts that help low- to moderate- income individuals and families build and protect assets. Income volatility is usually defined as the variance of income—meaning the amount of divergence from the average. In most cases, we are interested in looking at the number of substantial spikes and dips of income over a given period to assess the effect on a household’s financial life. Analysis of the evidence base suggests that much of the volatility is driven by the labor market, especially irregular schedules for hourly workers. Volatility seems to hit younger, single-parent families of color harder than others. There is evidence that income volatility has become “the new normal” for many families—particularly for low- and moderate-income families—over the past two decades. Research over the past three years confirms this. Given these facts, it is not surprising that 87% of EPIC expert survey respondents consider income volatility to be a major or critical problem facing the country. 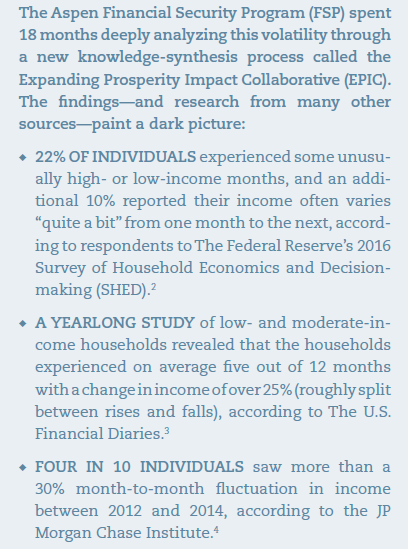 Households themselves are also concerned: When EPIC polled consumers about the issue, 82% said that income volatility had a somewhat or very harmful effect on them and their community. Expense volatility also exacerbates the impact of income volatility. Recent research from the JP Morgan Chase Institute finds that households experience surprisingly intense month-to-month fluctuations in expenses. Families earning the median income experienced month-to-month fluctuations that were equivalent to nearly 30% ($1,300) of their total average expenses. It is easy to see how destabilizing this could be: $1,300 is roughly equivalent to many families’ rent or mortgage payments. The report determined that each year, nearly 40% of households make at least one “extraordinary” high payment related to medical care, taxes, and cars. The report also made clear that households up and down the income ladder often struggle with both income and expense volatility, and that the spikes and dips do not align, making it extremely difficult to budget, plan for the future, and manage new financial challenges with existing resources. 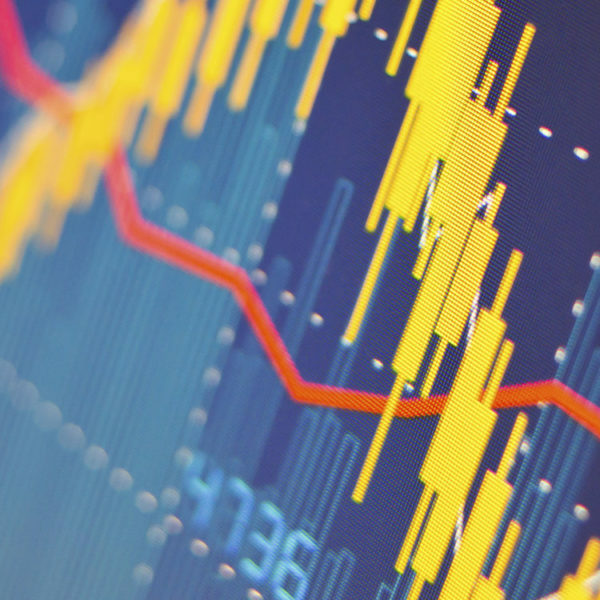 WHY DOES INCOME VOLATILITY MATTER? Volatility has been found to delay and disrupt important household consumption, including paying bills late and even foregoing necessary medical care. Volatility increases the risk of experiencing food insecurity. Month-to-month volatility can endanger a household’s ability to access safety-net programs. Fluctuation can lead to utility disruptions and housing instability. There are also volatility-generated expenses such as late fees and higher financial transaction and credit-servicing costs. Economically unstable households, including those who experience income volatility, tend to use alternative financial services at greater than average rates, exposing them to the risks of expensive, sometimes unsafe and predatory credit that leads to their own destabilizing consequences. The research cited above makes clear that income volatility has significant negative impacts that reach far beyond the family’s finances. Volatility undermines feelings of financial security, generating stress, anxiety, and even depression. It is cognitively taxing and can cause pessimism about the future and a lack of future orientation. Of particular concern are harmful non-financial effects of income volatility on children. Initial evidence suggests that parents facing economic instability can be less involved and less consistent in childrearing. Children whose parents’ health and educational attainment have suffered due to financial insecurity often face challenges such as behavioral problems, reduced mastery of skills, and low self-esteem that can hinder their own education. As is the case with so many aspects of poverty and financial insecurity, this can contribute to the generational transmission of poverty. Affected children may see reduced earnings and experience volatility themselves. Moreover, this kind of widespread, persistent income volatility adversely impacts the community. The Urban Institute completed a recent study estimating the costs of household financial insecurity on the health of cities overall. Urban’s key finding is that families facing one of three income disruptions—an involuntary job loss, a health-related work limitation, or an income drop of 50 percent or more—are more likely to be evicted, miss housing and utility payments, and/or receive public benefits—results that were also found in previous research. Obviously, these results have ripple effects on city budgets and community development. For example, households experiencing income volatility are more likely to be evicted, which can lead to greater municipal spending on housing assistance, homelessness prevention and rehousing, and other anti-poverty programs. Property tax revenue can dip if too many homeowners or landlords struggle to make mortgage payments. Cities with publicly owned utilities could also take a financial hit when their citizens miss payments, as Detroit did in 2014. The city faced national outrage over its decision to shut off thousands of mostly low-income households’ water in an attempt to collect more than $90 million in unpaid utilities bills. Given the percentage of Americans who are experiencing volatility, no community is immune. Income volatility can have serious repercussions that can harm entire communities and future generations. WHAT ARE SOME OF THE DRIVERS OF INCOME VOLATILITY? There are three main drivers of income volatility: instability and unpredictability in earned income, changes in income from public benefits, and changes in household income caused by changes in household structure. An analysis of banking records found that, for nearly one in four jobs, paycheck amounts varied by more than 30% paycheck to paycheck. This within-job variation in pay explains 86% of the month-to-month variation in labor income. Between 1971 and 2008, annual variability in hours worked has risen hand-in-hand with—and helps explain—the rise in income volatility. Week-to-week variation in hours and working a variable or rotating schedule are significantly related to higher income volatility. Three-quarters of EPIC’s panel of experts identified irregular hours as one of the three most significant causes of income volatility, by far the most popular choice. Modifications of benefit structures and eligibility requirements in recent decades have also made transfer income more volatile. Unemployment insurance coverage has been diminished, and it does not adequately assist those with the most fluctuating earnings (such as part-time and seasonal workers). The 1996 Personal Responsibility and Work Opportunity Reconciliation Act that “ended welfare as we know it” shifted many low-income families from the relative stability of monthly benefits to the variability of labor income supported by tax credits and other work-based assistance. Changes in family structure can certainly cause harmful disruption and volatility in income flows. A wage earner may leave the family due to divorce or death. Even welcomed household events—such as marriage or birth—can destabilize income and expenses. As children grow up and parents age, family care needs can shift—often unpredictably—and affect earnings. Recent research has documented the increasing severity of month-to-month fluctuations in income over the past decades. While the proportion of families experiencing income volatility somewhat increased, it has become a much greater challenge for those families to manage. Furthermore, experts expect both the proportion and severity of income volatility to increase over the next decade. In combination, these studies tell a consistent story: Income volatility is a widespread problem in the United States, and the household-level financial instability it creates can have serious repercussions that can harm entire communities and future generations. The experience of persistent income volatility undermines families across a range of issues from food security, physical health, and child educational success, to short-term financial health and long-term financial security. It is a complicated problem requiring more than one strategy and cross-sector leadership to both prevent the incidence of volatility and to mitigate its effects when it does occur. Importantly, while grantmakers can and should invest in more traditional kinds of activities—piloting financial service products, piloting/supporting social service programs, and supporting research—leadership is also needed to build collaboration across silos to see increased commitment to this issue. Income volatility is not just for “asset-building” funders. There is an important opportunity to connect funders focused on workforce, education, health, and community development given the cross-sector nature of income volatility. creating a marketplace with financial products and services designed to relieve liquidity crunches. The current strategies for managing income volatility are proving unavailable or inadequate for those most negatively affected. Low- and moderate-income households need a better tool kit. 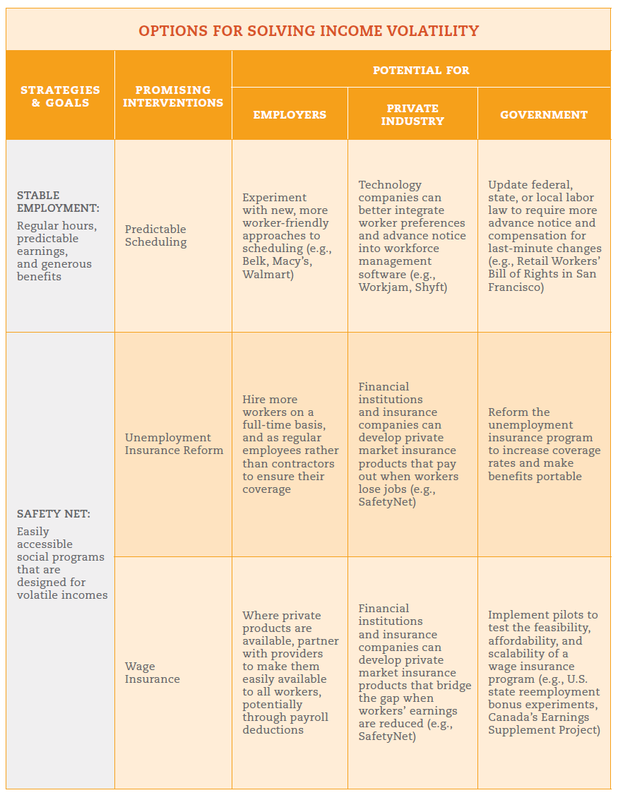 The table below presents a cross-sector framework that explores solutions along a spectrum that ranges from strategies to directly reduce income volatility to those that mitigate its impact. For each of the three main categories of identified strategies—those that support stable employment, access to a high-quality social safety net, and ensure consumers’ liquidity—we identify potential roles for employers, financial service providers, and government. In considering the framework, it is also important to recognize that solutions may not need to exist in isolation from each other. For a low-wage, part-time employee, for example, predictable job scheduling practices would reduce their level of income volatility but, for any given household, may be interdependent. For example, in order for a worker to find a new, more stable job, he may need access to government benefits or personal liquidity to afford the requisite training or job search effort and to pay for basic household costs. Not explicitly present in the framework is the role the households experiencing income volatility should assume. This reflects neither a denigration of their agency nor an abdication of personal responsibility. Households will inevitably be the ones making decisions about managing volatility. But one of the most problematic elements of the current economic environment is that those with the fewest resources are bearing an increasing level of risk and responsibility that used to be shared more evenly with employers and the government. Economist Jacob Hacker has called this the “great risk shift,” and others have documented its impact on higher education, healthcare, and retirement security. The institutional actors identified in the framework can, and must, do much more, and philanthropy can do much to spur action by those actors. Income volatility undermines the primary goal shared by many of us in the assets field: prosperity for all families. Moreover, it threatens the critical work of our colleagues that are trying to increase economic mobility through workforce development, education, health care, affordable housing, and food security. This issue demands not just our attention, but also the commitment and investment of a cross section of leaders. Not only do grantmakers have a critical role in investing in promising solutions and understanding their effectiveness, but they also can increase awareness of income volatility and build more support from fellow grantmakers, community leaders, business leaders, and policy-makers to embrace and take action on solutions. This section of the brief begins with an overview of strategies for grantmakers of all kinds to consider, followed by deeper explorations of the options for grantmakers operating at the national, state, and regional/local levels, as well as opportunities for impact investors. Clearly, there is no perfect way to organize these ideas; some national funders may and should consider how to invest in the solutions presented for local funders and vice versa. Solutions targeted to the state, local, and regional levels may be a good fit for funders working at many points along that spectrum. SEEK COLLABORATION ACROSS SECTORS. Better managing income volatility will require a holistic approach that combines product innovation and policy reform, prevention and mitigation, and labor and financial services interventions. This brief has identified focal areas for this needed innovation, and it provides a solutions framework for analyzing who is best positioned to act and what promising practices those actors can pursue. To truly make progress, grantmakers will need to both model collaboration and invest in collaboration across sectors, foundation portfolios, and grantees. Importantly, grantmakers have deep connections to many of the stakeholders in this issue employers, financial institutions, and policy makers. An important role for funders is to engage these stakeholders in the issue of and solutions for income volatility and build their leadership for action. INVESTING IN ADVOCACY CONTINUES TO BE CRITICAL. Some of the solutions require systems change. To fully realize that, investing in policy advocacy is crucial. For income volatility, the policy change needed may be at the local level (predictable scheduling), state level (wage insurance, unemployment insurance, scheduling, financial regulation), or federal level (wage insurance, unemployment insurance, financial regulation). This policy change is quite possible given the success that has already been seen. Funders can invest with their dollars in advocacy organizations and with their voice—leveraging their own powerful and influential position to call for specific policies and more attention to this issue. REASSESSING IMPACT METRICS FOR GRANTS. Given the undermining nature of income volatility, grantmakers will need to manage expectations around impact and be more patient and realistic about the time horizon for real change for families. For example, what is a realistic expectation for a savings pilot when half of the families work in jobs with significant income volatility? Similar questions can be asked across a range of investments from health and education to community development and economic mobility. Grantmakers should be working with their grantees across sectors to consider how programs and products might be adapted to account for income volatility and to measure the incidence of income volatility with their clients/customers. What updates to program design are needed? How are grantees understanding the household experience from families themselves? Without losing the bigger picture of shared prosperity, where do grantmakers and grantees need to pivot and consider reprioritization given these trends? Pilot hybrid solutions that build “sidecar savings” options into existing retirement systems. Fund policy advocacy aimed at eliminating asset limits in public benefits programs that can prevent low- and moderate-income families from saving.Support innovation that helps families build emergency savings through experiments with new kinds of employer and/or government incentives. Launch an educational campaign around these issues, supporting the development of coalitions of families, legislators, employers, financial service companies, regulators, and researchers necessary to make meaningful policy change. Flexible Paydays/Advance Payment. Though pay advance products show a lot of promise, we know very little about how effective they are at reducing the need for short-term, high-interest loans, or even if workers themselves prefer a lump-sum payment to more frequent paydays. Most of the limited research on these empirical questions actually comes from the developing world, but it may not be appropriate to extrapolate those results to the U.S. context. Given this uncertainty, funders should consider partnering with researchers, pay advance companies, and employers to test products in the field. PAYROLL INNOVATION. Other potential innovations in the payroll space could also benefit from experimentation. For example, identifying and working with a large employer (or gig economy firm with independent contractors) that would be willing to experiment with front-loaded paychecks (ensuring that workers get more of their monthly pay earlier in the month when most fixed expenses are due) or automatic enrollment in payroll deduction emergency savings accounts would be instructive to the field. REGULATORY INNOVATION. For these new types of products to be successful, regulators must be on board and prepared to resolve conflicting rules. 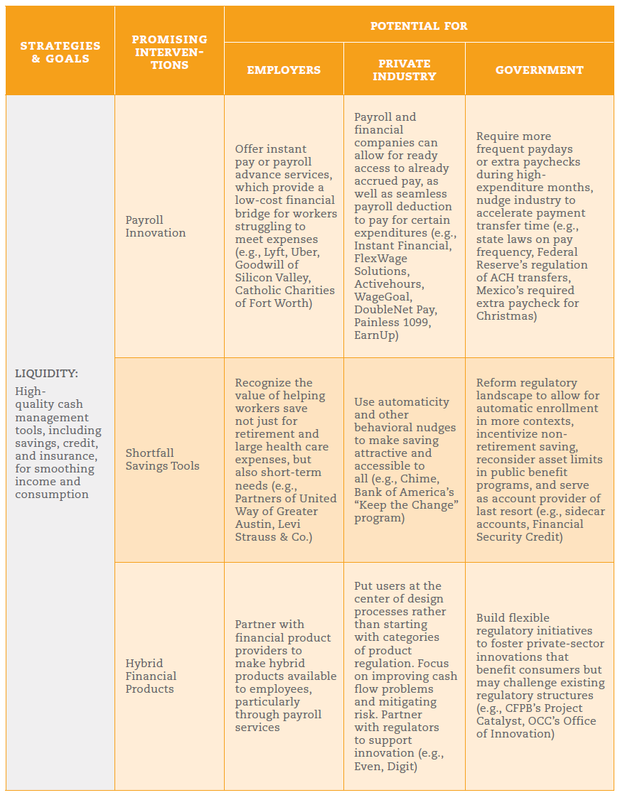 Many hybrid financial products combine features that are regulated quite differently, such as savings and credit, which are subject to separate federal regulations. States take very different approaches to regulating financial firms as well. To overcome these silos, funders should consider playing the role of capacity-builder and collaboration-facilitator. This could mean hiring—and paying—technologists to serve as fellows in regulatory agencies, establishing academies or agency exchange programs that teach regulators about new categories of financial products and financial technology, or holding forums at which regulators would be able to share information and interact with market innovators. WAGE INSURANCE. Wage insurance is a product or program that helps laid-off workers who take new, lower-paying jobs by replacing a proportion of their lost income. The idea of wage insurance is still in its infancy, with many outstanding questions about design, funding, and political appetite. While a full-fledged wage insurance program would require government backing, there is plenty of room—and great need—for innovation in the private sector. Collaborations between large funders are needed to provide the kind of capital essential for design, testing, and evaluation to better understand how to build this into national policy. QUALITY JOBS. Ultimately, reducing the prevalence of income volatility requires improving job quality. There are many components to a quality job, but as it relates to income volatility, the predictability of one’s schedule at work is of critical concern. When EPIC’s expert panel was asked to pick the best possible use of resources in the near-term to address volatility, 64% picked “demonstrating the value of reduced volatility to employers,” by far the most popular choice. Moreover, some of the largest victories to date have come through changes in employers’ policies. Some employers have genuinely altruistic motives, others are convinced of the business case, and others are responding to worker organizing or bad press. Whatever their reasons, employers are critical. Grantmakers can use their convening power and networks to engage more employers in this issue and invest grant dollars to help analyze and demonstrate the return on investment for employers. As part of this, funders can also raise up the powerful voice of workers and help support their own leadership in making change. In part due to the deep political divisions that characterize national politics and policymaking today, there are abundant opportunities to address income volatility at the state level. State-focused grantmakers can play a critical role in funding policy innovation and advocacy, and supporting pilots needed to make the case for national action. NEW PARTNERSHIPS WITH EMPLOYERS. Employers have direct access, existing structures, and relationships that could allow them to deliver a personalized platform—including innovative products—to promote employee financial security. Grantmakers can use pilots and research to explore the emerging role of employers to promote wealth building interventions and determine the evidence supporting the promise of these interventions. PREDICTABLE SCHEDULING. Employers are increasingly relying on sophisticated software for “just in time” scheduling, in which managers change workers’ schedules as needed in order to optimize staffing and reduce labor costs. This leaves workers uncertain about when and how long they will work and generates significant income volatility. Several cities and, most recently, the State of Oregon, have passed legislation limiting and regulating these practices in an effort to reduce income volatility and financial hardship. Grantmakers could play a major role in furthering the momentum created by recent legislation, developing or distributing model legislation, and building the case for national action through policy, research, and programmatic support. One especially important role for state-focused grantmakers is to fund the research necessary to evaluate programs and iteratively improve them by learning about what works for both workers and employers. UNEMPLOYMENT INSURANCE REFORM. Though grantmakers often try to avoid policy debates—an understandable tendency—reforming unemployment insurance (UI) is inextricably linked to government policy. But that does not mean funders cannot play a constructive role—they certainly can help ensure widespread access to UI through supporting state-level reforms related to eligibility standards, formulas that determine benefits awards, and the level of taxation needed to support the program. The National Employment Law Project, Center for American Progress, and Georgetown Center on Poverty and Inequality recently published a comprehensive report on UI reforms that addresses a wide range of state-level opportunities. Funders should first learn how UI policy is developed in their state. Who are the key stakeholders? What are their interests? There are a range of perspectives, so grantmakers can use their convening power to pull together the relevant institutions to identify solutions that can and should be tested, such as an advocacy strategy, making the case to employers, or modeling the costs of failing to make the necessary reforms. In the short term, there are existing legal advocacy projects and other local practitioners that help workers claim UI benefits. Those organizations need support and have technical expertise that is critical in discussions of how to improve the overall system. Some of the most innovative new solutions, such as predictable scheduling policies, have emerged at the local and regional levels. Funders focusing on local communities and regional economies are in an exciting position to invest in many of the solutions that will reduce income volatility. National funders are encouraged to partner with regional funders in these opportunities as well. PREDICTABLE SCHEDULING. Although Oregon made headlines lately by passing the first state-level predictable scheduling bill, cities have been the first movers, with legislation in San Francisco, Seattle, New York, and elsewhere. EPIC’s recent brief on predictable scheduling details a variety of local-level initiatives that may be relevant for funders. The effectiveness of many scheduling laws is not yet clear because they have been so recently implemented. The amount of localized activity in this area provides a great opportunity for natural experiments or other types of evaluations that can inform further program experimentation. One area particularly ripe for research and testing is the extent to which these new laws are being well enforced or followed. BUILDING LOCAL LEADERSHIP CAPACITY. One approach EPIC has developed is a new series called Finance Forward (www.financeforward.org), a multi-city event series that brings together U.S. mayors, business leaders, community advocates, and nonprofit leaders to identify and advance innovative and actionable solutions to income volatility. The “special sauce” of this effort is pairing together a public event to increase community awareness and engagement with a private roundtable of local leadership to build commitment to action. Regional funders can leverage their convening ability to take this model and build local momentum. Across all of the solutions, there is an opportunity for technology to facilitate scale, create efficiencies, and increase impact. In particular, the financial product solutions such as hybrid products, payroll innovations, private wage insurance, and shortfall savings, will need investors willing to support ideation, design, and testing of products in the marketplace. Startups in this space need patient capital, especially given the complicated regulatory hurdles as well as the trial-and-error nature of pricing new products and business models. Socially minded investors are well suited for this type of long-term and socially conscious commitment. Importantly, it is not just for-profit fintech companies developing these innovations. Non-profit organizations such as Commonwealth and EARN are leading the way with savings and hybrid products designed for and with users experiencing income volatility. Impact investors have a critical role in accelerating this work and ensuring that the products and services will benefit a more inclusive market of consumers. This analysis is grounded in the emerging convergence EPIC has identified in its work to date: a thorough scan of the academic research and articles in the popular press, four expert surveys, and two expert convenings, one of which was spent intensively refining this framework. Even with this convergence, some uncertainty and disagreements remain. The path forward for grantmakers requires attention to three key questions: what works, at what scale, and at what cost. That analysis must look beyond a narrow view of effectiveness for the particular population studied to consider market viability broadly defined: the value proposition for attracting sufficient investment, the relative appeal among the competing priorities of public and private actors, and the anticipated reduction in the overall incidence of the negative consequences of income volatility. Income volatility is a complicated, multi-faceted problem. Instead of searching in vain for the one “magic bullet” intervention that will solve it, we must seriously consider—and experiment with—a wide variety of potential fixes. This brief was based on research and writing from prior Expanding Prosperity Impact Collaborative (EPIC) briefs. EPIC is an initiative of the Aspen Institute Financial Security Program, which investigates economic forces that severely impact the financial security of American families. As such, the Aspen Institute Financial Security Program would like to thank Steve Holt of Holt Solutions for synthesizing the research literature and writing prior related briefs. While this document draws on insights shared throughout the process, the findings, interpretations, and conclusions expressed in this report—as well as any errors— are EPIC’s alone and do not necessarily represent the view of EPIC’s funders or participants. Aspen Institute Financial Security Program would also like to thank Ida Rademacher, Laura Duty, Dena Jackson, and Evelyn Stark for their feedback on this brief. Additionally, Aspen Institute thanks all the participants in the EPIC process including the Advisory Group members, expert panel participants, and convening participants. All of these contributions were critical to EPIC. EPIC thanks all of its funders for their generous support.